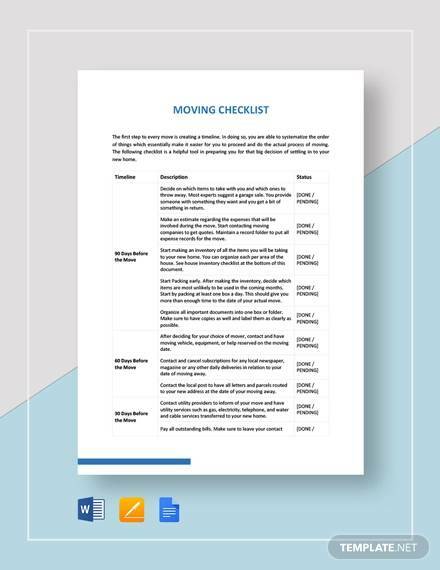 A sample Moving Checklist Templates is just a sample format to suggest how you must prepare a checklist when you are preparing to shift from one house to another, one office to another or from one city to another. No doubt you may seek help of a moving service, but then again, things which you will be taking along with you and things that will be left out or sold out, will be decided by you only. 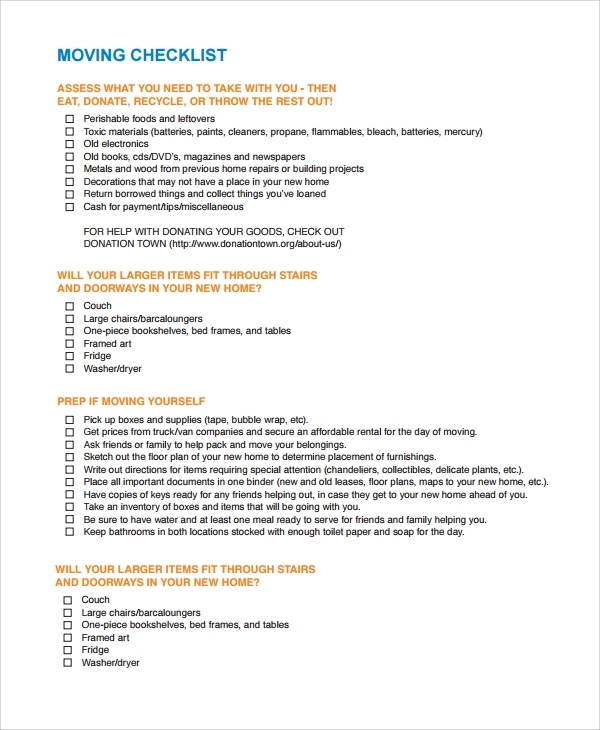 Hence you need this moving and cleaning checklist template to give a direction to the much thoughtful and tiring job. 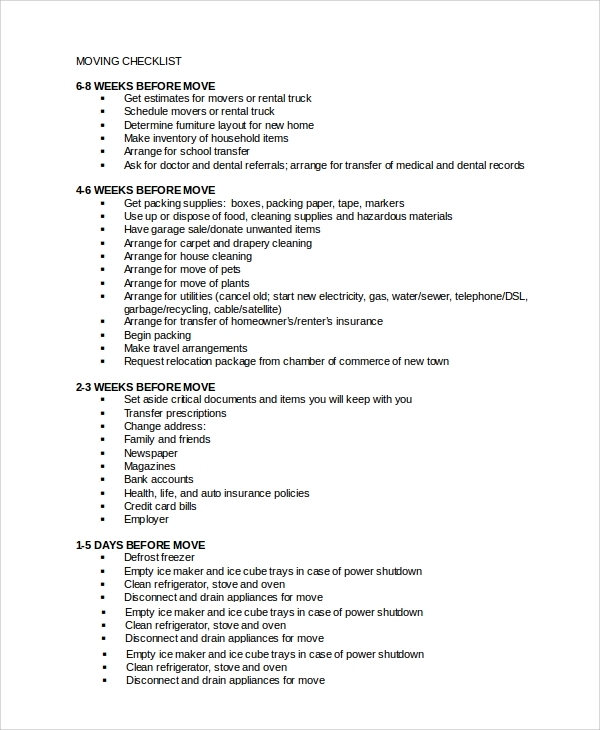 The house moving checklist gives you a general list of all items which you move with you, as you shift from a house to another. This may be an intercity shift or cross country shift, but the generic form contains all items which you must take along in any circumstances, thus letting you never miss anything important. 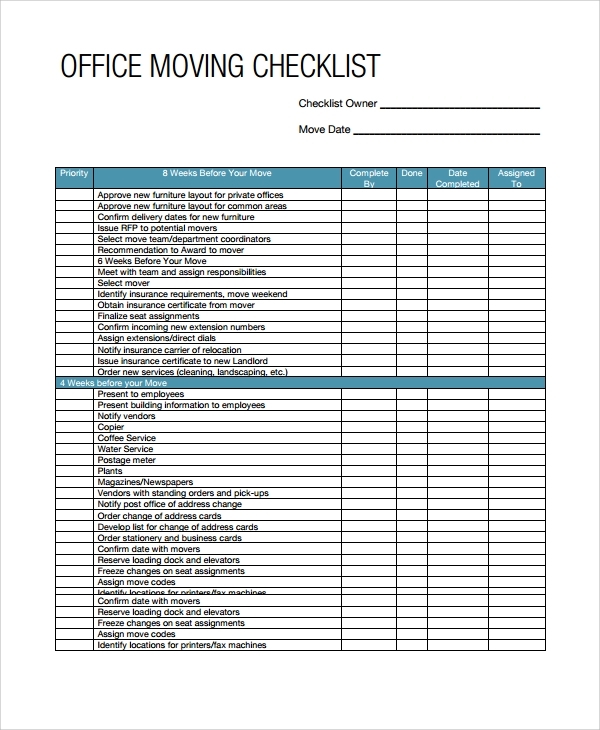 Office relocation checklist format is to help movers who are shifting their offices. Office shifting is a tight situation, as you have to transfer so many things with duty and while monitoring. The main hassle starts when you have to make a list of all goods that are to be transferred. To simply this the checklist template is a good solution. 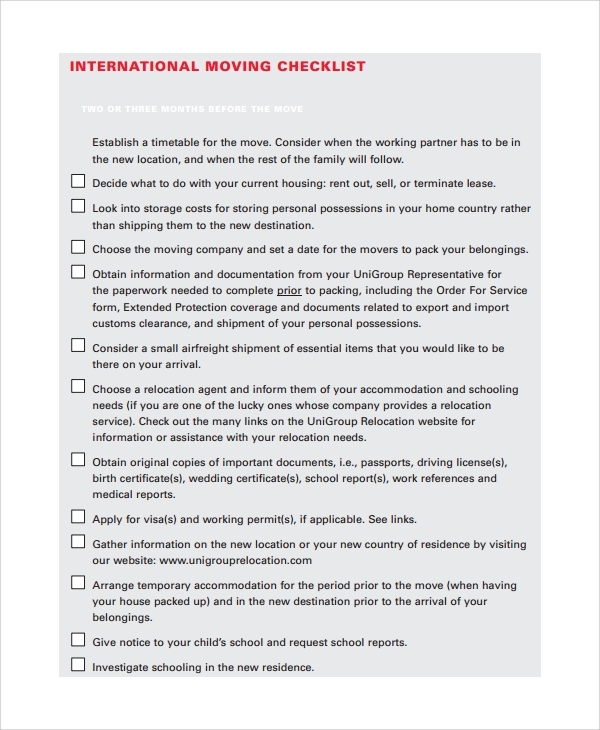 The moving abroad checklist template is a completely ready checklist that tells you all the important items you need to move abroad. 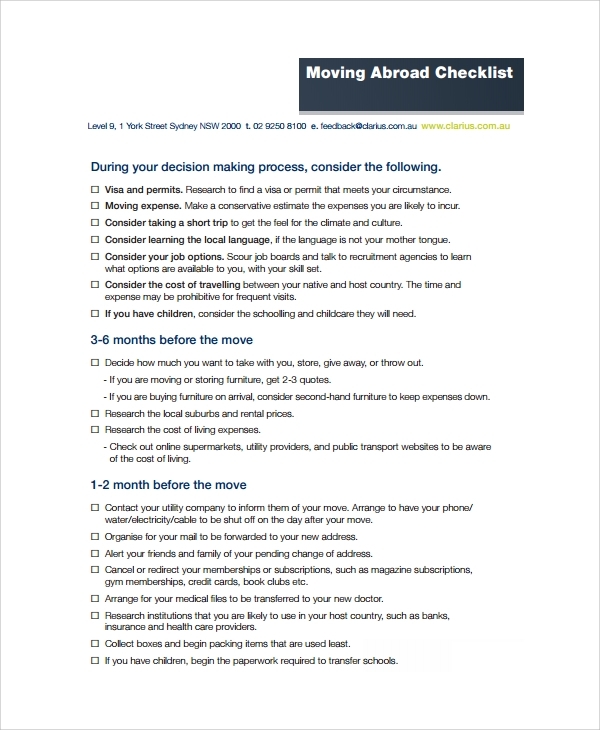 Moving abroad has to be planned well, and when you refer to the sample or checklist template you can plan things quick and easy. 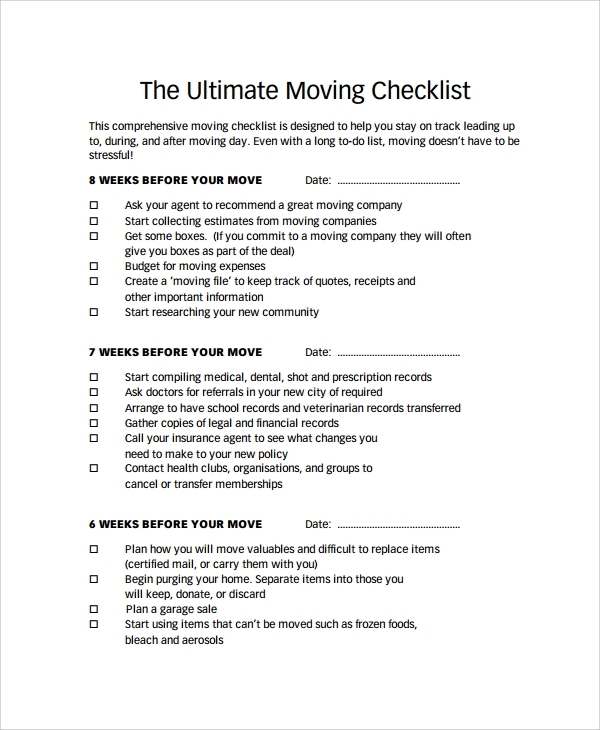 What is a Moving Checklist Needed for? 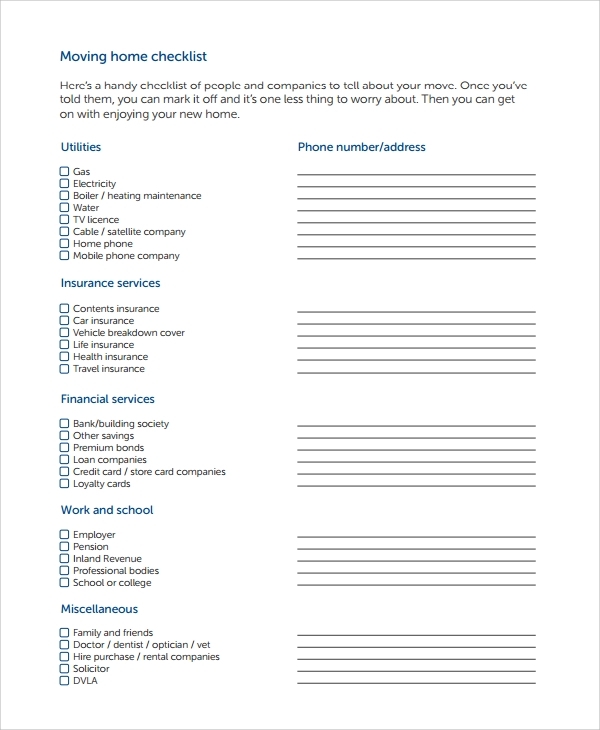 Therefore the list simplifies your planning a lot and gives you the already important items in the list. Next you may add some more items which are not there and complete the list. What is the Importance of a Sample Moving Checklist? It’s during shifting that people break, lose and damage many things and that is simply for not having a good plan. Therefore planning with a proper checklist that will contain names of items with segregation as breakables and durables is always a good idea, and hence the use of sample moving out checklist you get online is recommended. How to Use a Sample Moving Checklist? The important items which match with your acquisition must be therefore included in packing. A checklist would come with checkboxes. Hence printing one is a good idea and then you may get items packed. As per the list keep striking the items and proceed. 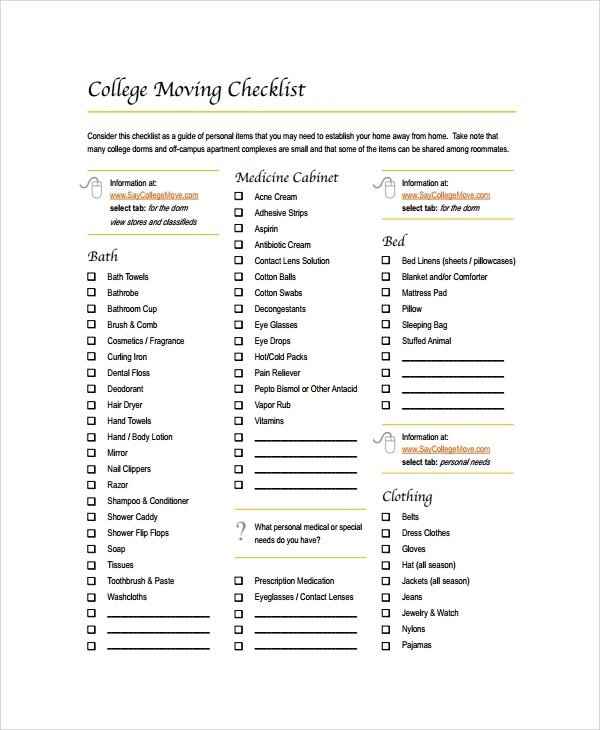 As you start to use the moving checklist, you will see that planning has become so easy and smooth, that you will never again feel the pressure of missing items or missing details. You will have all important movables in front of you with the project checklist sample.